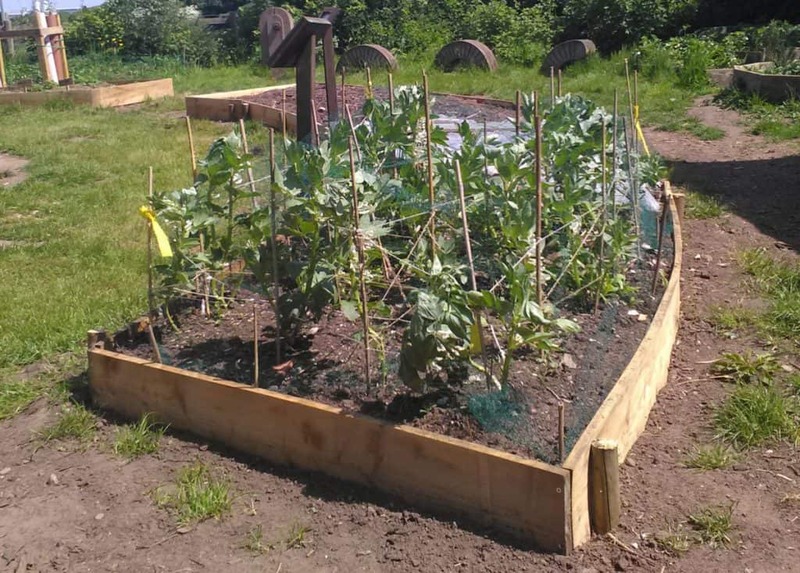 Over the extremely hot weekend of 19th and 20th May, I along with our other intrepid volunteers set out to make some improvements to our Community Garden. The wooden slats on our raised beds were badly in need of replacement. Being an organic garden we don’t use treated wood so over the last ten or so years the wood slowly rots away. Even the hot sun beating incessantly down on us, did not deter us from our enjoyment of using old skills and learning new ones to replace the old wood with brand new, untreated wood. It should last us another ten years and looks brilliant. I’m sure the Care Farm groups will be delighted with the results. The willow ‘hideaway’ dome was also given some loving care and attention, the higher growing and outgrowing branches were weaved into the older in-growing branches to reform the ‘dome’. A great place to shelter from the hot sun. Jacob helped with this along with Charlotte. Rick and Chris have also put a waterproof cover on our amazing roundhouse in the Forest School area. I won’t get wet now while I’m talking to groups of children sat in the dry on the benches, also built by volunteers. Soon the panels around the roundhouse will be completed, using re-used and natural materials. This will stop the prevailing winds blowing through the roundhouse on colder days, but it won’t detract from the natural beauty of the area. Our culinary needs were provided for by Charlotte and we were grateful for all the natural, healthy food she supplied (As well as the chocolate and sticky toffee cake baked for us by Chris Mould). It was also the last volunteer weekend organised by Wendy, she is always full of energy and has the skills and knowledge needed for the practical activities around the farm. If you want to join in our Volunteer Weekends keep an eye on our site or Facebook page, where we will keep you informed of all volunteering opportunities. Hard work and lots of fun can be had in equal measures.